What woodworker couldn’t use an extra pair of hands? And bigger machines? As a full-service mill shop and hardwood lumber distributor, we have the equipment to do all kinds of things you may not be able to do in your workshop. Here at KenCraft we offer over 60 species of domestic hardwood lumber and exotic lumber to meet your woodworking needs. Click one of the links below to learn more about our products and services. Over 20 different dust collector fittings available – both in stock and custom made to fit your system. Check out our offering of sheet metal wyes, blast gates, hoses, reducers and more! Choose from our line of over 25 different moldings made and stocked in 5 species of lumber. We can custom match any molding as well! Countertop brackets, shelf brackets, and cedar closet lining are just a few of the other refinishing items we offer as well. A very unique and hard to find flooring is available here at Kencraft! 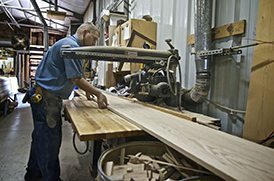 We carry over 50 different products to help your woodworking project. Don’t forget to pick up dowels, glue, butcher block oil, Whiteside Router Bits, screws, Kreg Jig & accessories or CTM Saw Blades from us! Whether you use a lathe or carve by hand, KenCraft has the high-quality, hand-picked wood you’re looking for. Making that special gift is priceless, however, you do not have to spend a lot to do so. Bow Bread Knife Kits & Supplies, breadboard supplies, and other items available to allow you to create that one of a kind gift. Choose from our wide selection of products and services such as: You need it for your next woodworking project? The KenCraft Company has it! Contact us to learn more about our huge selection of hardwood lumber. *Our selection ranges from 1/16” thickness up through 16/4”. All of our stock lumber is random widths and lengths.